Speaking at today’s Activate conference in London, Stephen King from the Omidyar Network just announced a grant of extraordinary importance to mySociety. Over the next three years, the Omidyar Network is granting mySociety an amazing $2.9m. Internationalising our current British websites, and helping people around the world to build sites and apps that will drive greater transparency and accountability. Growing an ever-stronger commercial team, to help cover our costs which remain unfunded (still substantial). Continuing to grow the impact of our UK sites. If you’re someone who’s ever given us £5 or £10 to support our work, or who’s given your time volunteering on any of our projects, we have a special message for you: we would never have been able to get to the sort of scale of support that today’s grant represents if people like you didn’t believe in us all along. Thank you, and thank you for your continued support – our growing ambitions to make ever greater positive impacts on the world means we need more friends than ever, not fewer. The overall impact of this grant, plus continued support from groups like the Open Society Foundation, Hivos, the Esmée Fairbairn Foundation, Indigo Trust – and many smaller donations – is a huge increase in our overall capacity. We can build more software, help more partners, work with more clients, give more advice. So if you’ve thought about working with mySociety, or using our open source tech for your own goals, there’s never been a better moment. Get in touch or talk to us on Twitter. Statistics were recently released on the performance of UK central government departments with respect to their handling of freedom of information requests. The latest figures are for the second quarter of 2009. We have been able to use these to calculate the fraction of all requests which are made via mySociety’s freedom of information website WhatDoTheyKnow.com. 13.1% of all FOI requests to “Departments of State” in the second quarter of 2009 were made via WhatDoTheyKnow.com. In absolute terms this was 753 out of 5769 requests; this is up from 8.5% in the first quarter of 2009. 32.3% of FOI requests to the Home Office (which includes the UKBA and the IPS) were made via WhatDoTheyKnow in the second quarter of 2009. In absolute terms this was 206 out of 638 requests. The latest figures show that in twelve of the UK’s twenty-one Departments of State more than 10% of FOI requests were made via WhatDoTheyKnow. What these statistics mean is that an ever increasing fraction of the information released in response to freedom of information requests is being archived and made publicly available by WhatDoTheyKnow.com. Hopefully this will reduce the number of duplicate requests being submitted and ensure the information released is made available to the widest possible audience which in-turn should increase the chances it is acted on. Only forty-three central government bodies have their freedom of information performance monitored centrally. This is a tiny fraction of the three thousand or so bodies currently listed by WhatDoTheyKnow. Detailed statistics on WhatDoTheyKnow’s share of requests on a per department basis. What percentage of FOI requests are made using WhatDoTheyKnow? Comments Off on What percentage of FOI requests are made using WhatDoTheyKnow? The volunteer team behind our Freedom of Information (FOI) site WhatDoTheyKnow.com, has used statistics released by the Ministry of Justice to discover the proportion of all FOI requests being made via the site. They found that in the first quarter of 2009, 8.5% of all requests made to central government departments were made using WhatDoTheyKnow. In absolute terms that was 514 of 6019 requests. The breakdown by department is given in the below table. Notably, one in five FOI requests to the Home Office (122 of 643) were made via WhatDoTheyKnow. WDTK = WhatDoTheyKnow; Source for total FOI request statistics : Statistics for Q1 2009 (released on the 25th of June 2009); Extended table covering all monitored bodies available. The Ministry of Justice only monitors, and provides statistics on, 44 bodies’ compliance with the Freedom of Information Act; WhatDoTheyKnow currently lists 2910. We cover a wide range of local bodies including Primary Care Trusts, Local Councils and the Police. There is no national monitoring of how many FOI requests are made to such bodies, or how well they perform when responding to requests. If you want to see such performance statistics, please help categorise more of the responses made via the site. It can be quite addictive! Thanks to Richard Taylor for doing this research – see his blog post for some more details, including some information about Scotland. FixMyStreet has a lot of RSS feeds. There’s one for every one-tier council (170), one for every ward of every one-tier council (another 5,044), two for every two-tier (county and district) council (544), and two for every ward of every two-tier council (20,296) – two per two-tier council because you might want either problems reported to one council of a two-tier set-up in particular, or all reports within the council’s boundary. 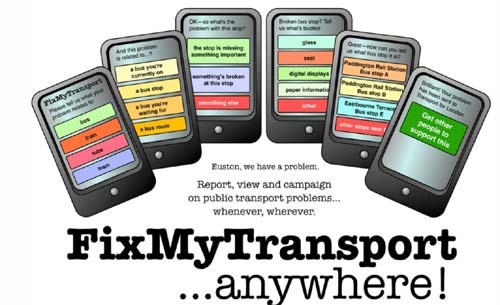 Every single one of those feeds can be subscribed to by email instead if that’s preferable to you, and are all accessible through a simple interface at http://www.fixmystreet.com/alert. However, none of these RSS feeds was suitable for the person who emailed from a Neighbourhood Watch site and said that all they had was a postcode and they wanted to display a feed of reports from FixMyStreet. Given you could obviously look up a FixMyStreet map by postcode, it did seem odd that I hadn’t used the same code for the RSS feeds. Shortly thereafter, this anomaly was fixed, and if you now go to a URL of the form http://www.fixmystreet.com/rss/pc/postcode you will be redirected to the appropriate local reports feed for that postcode (I could say that adds another 1.7 million RSS feeds to our lot, but given they’re only redirects, that’s not strictly true). And after a couple more emails, I also added pubDate fields to the feeds which should make displaying in date order easier. It’s great to see our RSS feeds being used by other sites – other examples I’ve recently come across include Brent Council integrating FixMyStreet into their mapping portal (select Streets, then FixMyStreet), or the Albert Square and St Stephen’s Association listing the most recent Stockwell problems in their blog sidebar. If you’ve seen any notable examples, do leave them in the comments. My house mate just said that his friend, who is at sixth form college, just had a PSHE (personal, social and health education) lesson in which they studied the website TheyWorkForYou.com. Apparently it is good and I should go to it.